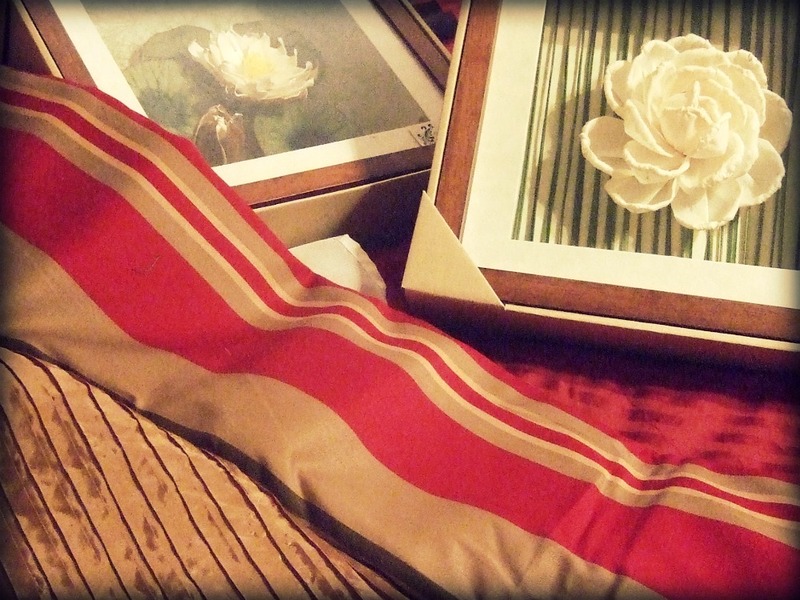 First, a mea culpa to my mom (though she doesn’t read the blog – I need to put it out there). Wait, before that even – there’s an explanation: In the process of doing the bedroom project it was important for me to CLEAN OUT MY CLOSET. Apologies for shouting, but I’m trying to pound it into my own head. It’s been needed for quite a while. In fact, I bought a red storage tote – last year – just for the purpose of keeping the clothes I couldn’t part with when I cleaned the closet. The tote has worked well as a surface for me to pile clothes on – until today. You see, I have a problem with clothes. I don’t like to let them go. My weight fluctuates so much that I can justify it, usually. And I don’t give two rips about what’s stylish at any given point in time; I just try to wear what I like and whatever I think looks good on me. I have so many clothes that, most of the time, I don’t wear what’s hanging in my closet. Most of the clothes I wear on a daily basis are stored elsewhere: folded on top of my dresser, in a pile to be hung (but never actually gets hung up), or draped over the armchair in our bedroom. It’s stupid, I know. I can own it. 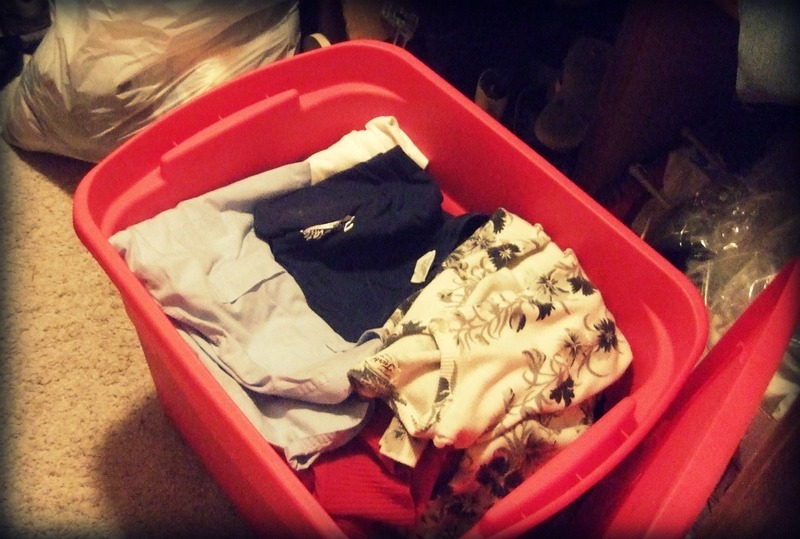 There’s the red tote of clothes to keep. Alma mater t-shirt and my great grandmother’s sweater right on top. Behind the tote is a bag of clothes to donate. In my very last post I accused my mom of having a faulty memory and doing something with the black & white dress (my favorite). I honestly thought she had given it away. Sorry mom!! I do have some others that are missing and I’m sure those were donated – but these were my favorites and I’m so happy I still have them. Sizes 5/6. Back to to the bedroom project update. But, with such a plain bedding choice I was left trying to figure out what colors to pair with it in the room. I also needed to pick a wall color and some decor. Luckily the lamps I have in the room already have red shades so we’re all set there. You can’t tell, but the big greenish stripe is actually a different color than the small greenish stripe. So, the color palette is red, a goldish taupe, green, & cream.We’re going to paint the walls cream. I’m considering an accent wall in a deeper color. We’ll see. All in all, it’s going well. I’ve spent under $80 for everything. Next steps are: 1. finish cleaning out the room, 2. buy the paint & then actually paint (big job! it’s a good-sized room), and 3. figure out some additional shelving/storage options for the room. My thrift store shopping today was unsuccessful in that department. Next Article Why isn’t it Friday? Yea for finding the dresses…..what a nice surprise!!! !I think for one wall, maybe the wall your closet is on (not sure how your closets are, but we have two on one wall) you should paint it the red, and the other 3 the cream color. Thanks Lacy! Painting red in the bedroom makes me a little nervous. I'm not sure why. I'm not scared of red – at our last house we painted our kitchen red. 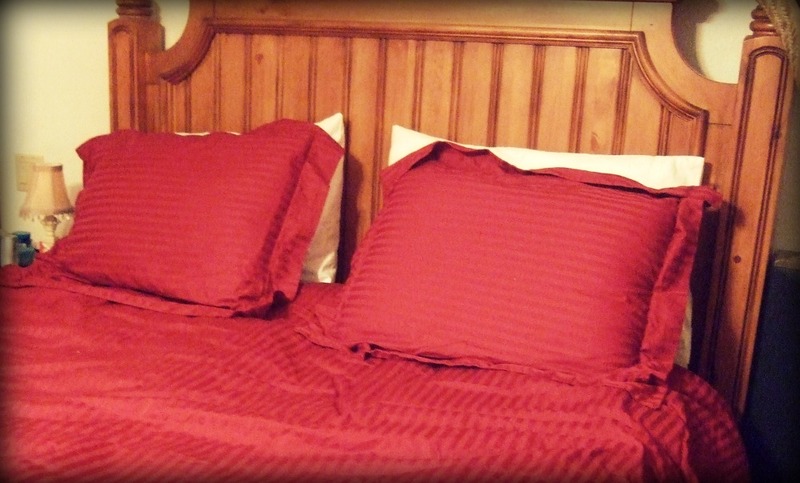 I've always thought blue was a good color for a bedroom – soothing, you know – but we always gravitate towards red. I think we're going to look at paint today so we'll figure it out then. Outstanding. The room is coming along. I should show you the many places I have clothes. It's embarrassing. Truly. I have everything from size 4 to 14. Ugh. Can't bear to give away the 4's. They are only from 2 years ago but I know I'll never ever wear them again. Still. JCrew. Too much to donate. 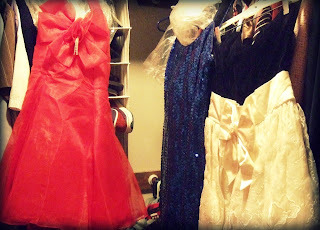 Sigh.I so desperately wish I had my prom dresses. Most of them were crap but there was one floor length black lace over cram silk vintage gown from the 40's. It. Was. Awesome. Oooh, 40's vintage – how cool! Pic?